Should you tile to the walls or leave a small space? When installing floor tiles, should you tile to the walls or leave a small space for movement and flexibility? To answer your question about whether to leave a space where a floor meets a wall – Yes! A gap of approximately 1/4” should be left at all changes in plane (for instance where a floor meets a wall) around the perimeter of the installation. This gap should be present in the underlayment and tile. If no trim will be installed to cover the gap, a “soft joint” can be made with appropriate sealant, or certain trim profiles can be installed to accommodate movement and expansion. This gap should also be left where tile abuts cabinetry, pipes or other permanent fixtures. Any other change in plane such as where a wall meets another wall must also have a soft joint installed to allow for movement and expansion. Also, expansion joints must be properly placed and installed in the tile field depending on the location and size of the installation. Additionally, control joints and saw cut joints in concrete must be honored through the surface of the tile to avoid future cracks in the finished installation. These specifications and the many, many other details related to a successful tile installation can be handled by your qualified contractor and certified labor. Kenneth Williams passed away June 10, 2016, in a hospice facility near Atlanta, Ga. He was born February 11, 1925, in Atlanta, and attended Boys High and the Darlington School (Rome, Ga). 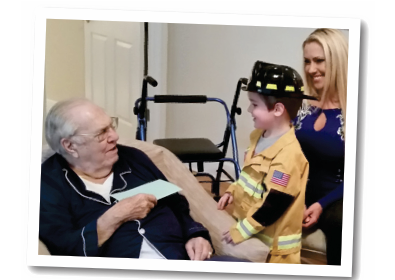 He was a World War II veteran, serving in the Army Air Corps. Upon returning from the war, he went to the University of Georgia and graduated in just 2-1/2 years! In 1950, he and his college roommate, Whit Sweetin, formed Williams Tile and Terrazzo, which survives today as Williams Tile and Marble. He served as a trustee on the Bricklayers #8 Board, director of the Atlanta Builders Exchange, director of TCAA, and president of the Georgia Tile and Terrazzo Contractors Association. In addition, he was president of the Southern Tile Contractors Association, the predecessor of NTCA. Joe Tarver, NTCA executive director emeritus, recalled, “The association was a small 13-southern-states regional group at the time of Ken’s presidency, going through some tough times financially and growth-wise. Ken’s contributions, before, during, and after his presidency helped immensely in keeping the association afloat. Ken was a consummate professional in every respect during a period when that was not always the case. His appearance, speaking ability, business acumen, and organizational skills helped control a struggling association during some difficult times. Ken was instrumental in consulting with Forrest Attaway, Brannon Murray, and Bob Roberson – names I’m sure you are familiar with – in hiring me, working tirelessly to grow what is now NTCA, and promoting unity within a fragmented industry. Ken was a class act in every respect. He was very proud of his legacy as a man, husband, father, and teacher. He is loved by those who knew him, and will be missed. USG Durock™ Brand Tile Membrane is ideal for use under tile in residential and light-commercial applications. This product is water-resistant, thin and vapor-permeable for use on nearly every floor or counter top designed to accept tile including bathrooms, kitchens, laundry rooms and entryways. TEC® announces a sweeping new roster of surface preparation products that deliver installation advantages and improved product performance. The expanded TEC® surface-prep line includes 10 new products in five general categories: self-leveling underlayments; skimcoats; patches; crack isolation systems; and specialty products including wear layer overlayments. The expanded breadth of the new TEC® surface preparation line extends the company’s commitment to provide product excellence while helping contractors save time and money. The new line also builds upon the company’s leadership position in the grout and mortar product categories. The new TEC® Level Set® 300 Self-Leveling Underlayment is a premium underlayment that’s formulated for fast-track flooring installations. Ideal for quick turnarounds, it is walkable in just two to three hours – and provides a flat, extremely smooth, durable surface. It’s suited for a feather edge to 2” single application and boasts a compressive strength of 5,500 psi. The new TEC® Feather Edge Skim Coat is a proven solution that’s designed to skim coat, smooth and level irregularities from feather edge up to 1⁄2”. With exceptional performance and bond strength, it sets in as few as 15-20 minutes for most flooring. The new TEC® Level Set® Deep Pour 3 surface prep solution helps installers power through projects to quickly fill deep trenches up to 3” in one lift, without aggregate. Ideal for thick-build applications without comprising return-to-traffic timing, it accepts non-moisture sensitive tile and stone within only four hours. The extensive new lineup also includes specialty surface preparation products. The new TEC Level Set LW-60 is a high-quality, ultra-lightweight self-leveling underlayment that’s ideal for multi-level structures where load-bearing restrictions apply. Fifty percent lighter than traditional self-levelers, it doesn’t compromise coverage, traffic or installation time. The new TEC Level Set Wear Topping is a decorative concrete finish available in three base colors that accepts stains, sealers and coatings within 24 hours after application. Colorant can be added at time of mixing to bring flair to any concrete floor or other concrete surface. Bostik, Inc. announced that Michael Zaccardelli has joined the firm’s Consumer & Construction Business Unit as sales director, North America. He will lead the Pro Distribution business in the U.S. and Canada with regional sales managers Rick Tredwell and Brian Kelly reporting to him. He and his team will also build out Bostik’s long-term sales strategy to align with the company’s business mission to drive double-digit growth. Zaccardelli comes to Bostik after 17 years with Knauf Insulation, holding positions of salesperson, marketing manager and ultimately national sales manager. Prior to Knauf, he brought his engineering degree to U.S. Gypsum, where he worked for 11 years. Lackmond Products, Inc. has named Russell Ayers as director of Customer Service, overseeing the company’s inside sales strategies and operations for both the Lackmond Products and Lackmond Stone divisions. Ayers brings 38 years of experience working with UPS in sales, operations, marketing and strategy. He also worked directly with many large accounts on growth and efficiency strategies. Russell and his wife, Siler, enjoy spending time with their two sons. When not working, Russell enjoys college football, camping at NASCAR races, hunting, fishing and house projects. Coverings, the largest international tile and stone show in North America, has appointed Taffy Event Strategies, LLC (www.taffyeventstrategies.com) as its show management company. Taffy will be responsible for producing Coverings’ exhibition and conference program. Coverings 2017 will be held April 4-7 at the Orange County Convention Center in Orlando, Fla.
Coverings is the premier international trade fair and expo dedicated exclusively to showcasing the newest in ceramic tile and natural stone. 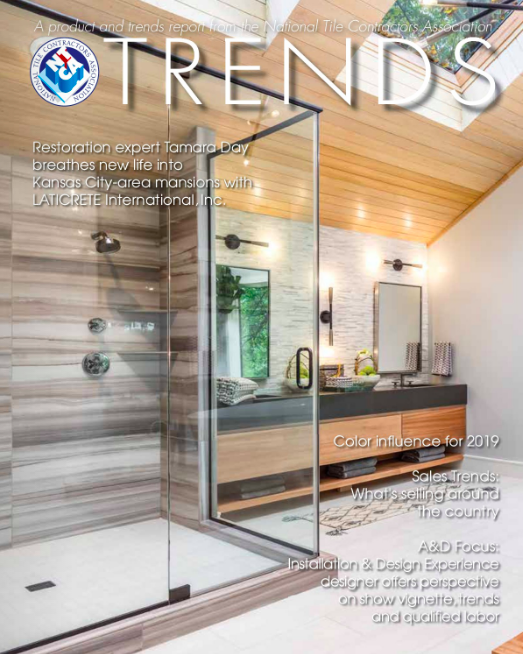 It has grown to be the most important show of its kind in the U.S., featuring 1,100 exhibitors from more than 40 countries and attracting thousands of distributors, retailers, fabricators, contractors, specifiers, architects, designers, builders, and developers. Taffy, based in Arlington, Va., is a full-service trade show and management company focused on producing events that inspire audiences, create connections, and deliver results. The Tile Shop, a specialty retailer of manufactured and natural stone tiles, setting and maintenance materials, and related accessories, recently introduced an integrated digital Design Studio capability in all stores and online, allowing customers to personalize and visualize how an entire room or a distinct space will look upon completion of their project. The Design Studio gives customers and sales associates a collaborative platform to create customized 3D design renderings to scale, using specific shopper room dimensions. Shoppers can choose from an extensive selection of The Tile Shop’s tile and stone products, trim and grout, visualize various tile layout possibilities and select accompanying furniture and accessories, including lighting. Tile layouts of floors or walls can be changed at the click of a button. The Design Studio is available without an appointment at any of The Tile Shop’s 118 store locations, or shoppers can register online at tileshop.com to use the service on a computer or mobile device. The tool’s collaborative design capability means that anyone who receives a shared plan can edit it directly. Once a final design is chosen, the Design Studio also has the capability to tabulate exact product quantities needed to complete the project. Shoppers can also request a cost estimate for an individual Design Studio rendering by sending it directly to The Tile Shop showroom in their area or by submitting it online at tileshop.com, and an associate will follow up to provide a project estimate. Alternatively, they can send renderings directly to their preferred Trade Pro for an estimate. Daltile (www.Daltile.com) has officially opened the doors on remodeled showrooms in the Denver and Las Vegas markets. Both locations celebrated with grand opening events in early August. A slab yard attached to a traditional gallery setting at both locations provides a single-source resource for local architecture and design communities. A floor-to-ceiling desert cactus mosaic mural welcomes visitors to Daltile’s Las Vegas tile and stone gallery. Multifunctional workspaces, tile libraries, hospitality areas and conference rooms were remodeled with design professionals and clientele in mind. A floor-to-ceiling desert cactus mosaic mural welcomes visitors to the 5,800-sq.-ft. Las Vegas tile and stone gallery, located at 3345 W. Sunset Road, Suite G. Products are artfully displayed on floors, walls and partitions. The space includes a loose tile library and an LCD touch screen that allows customers to virtually flip through the digital catalog, view inspiration gallery images and build out designs with the tile and stone visualizer tool. A custom chandelier made with tile pieces, offers inspiration for guests. The hospitality area features a stunning diamond-matched Aqua Marine Granite backsplash and bright white Morning Frost ONE Quartz countertops. The intimate conference room showcases a striking slab tabletop. The Daltile Denver showroom features a fireplace vignette with four book-matched slabs. In Denver, the 4,700-sq.-ft tile and stone showroom at 852 S. Jason St., Unit 8, features an entry area with a large stone slab desk with waterfall accent that provides a focal point for visitors to begin their journey through the space. An accompanying fireplace vignette featuring four book-matched slabs warmly welcomes visitors and showcases the striking stone slab offerings. 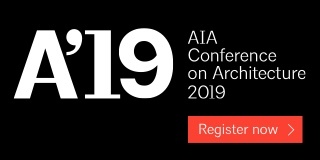 Dodge Data & Analytics’ Sweets apps for Revit and AutoCAD were awarded Architosh’s “BEST of SHOW” honor in the Building Information Modeling (BIM) software category at the AIA Convention earlier this year. Dodge was recognized by the trade publication (which serves CAD and 3-D design professionals) for the elegant integration between Sweets data and the Autodesk applications Revit and AutoCAD, which enables users to bring Sweets’ richly annotated products directly into their design tools at an early stage. Launched in January 2016, the Sweets app for Revit provides product integration for the 3-D design software’s 400,000-strong user base, while Sweets for AutoCAD, previewed at AIA and launching later this year, offers support for 2-D design projects and will be available to millions of AutoCAD users worldwide. The Sweets apps are a key component of Dodge’s commitment to simplify design professionals’ workflow by delivering Sweets’ richly annotated products right into their design tools. A number of key partner companies have already adopted the Sweets app for Revit, including Allegion, C/S Group, Sloan, Armstrong Ceilings, Excel Dryer, and Maxxon Corporation. Since AIA, other firms such as AMX by Harman, American Specialties, Inc., and Terrazzo & Marble Supply have also begun implementing the new software. Dan and Elizabeth Lambert of Lambert Tile and Stone, located in the Vail Valley of Colorado, have been providing high-end residential tile installations since 2000. At Lambert Tile and Stone we install around 30 residential steam showers per year in the mountains of Vail, Colo. Thanks to technology, our steam showers and steam rooms have evolved over the past number of years with better insulating and lower vapor-permeance qualities. Regardless of steam room/steam shower design, it is critically important that the enclosure incorporates the correct membrane, since not all membranes are suitable for high-temperature and steam applications. Steam rooms and steam showers have been a popular option in ski resort communities. Resort and hotel spas, as well as fitness centers, offer this amenity for the health benefits steaming provides. This luxury benefit has enticed many people to incorporate steam units into their own homes, and this trend is growing in popularity. Ninety percent of the steam showers we construct are not continuous-use steam rooms, but master bath and guest suite showers designed with the option to have steam while the occupants shower. Since 90% of our assemblies include rain heads and body sprays, these steam shower designs usually opt for level ceilings. But all of our commercial and residential continuous-use steam rooms are designed with the 2” per foot ceiling slope that is shown in TCNA Handbook methods SR613 and SR614, to minimize condensation from dipping onto occupants. Regardless of steam room/steam shower design, it is critically important that the enclosure incorporates the correct membrane, since not all membranes are suitable for high-temperature and steam applications. Consult with your technical services department of the manufacturers of materials you are considering to ensure compatibility and permeance performance of the membrane. Thanks to technology, the Lambert’s steam showers and steam rooms have evolved over the past number of years with better insulating and lower vapor-permeance qualities. The TCNA Handbook for Ceramic, Glass, and Stone Tile Installation contains two methods. Method SR613 is for steam room installations over concrete or masonry, and SR614 is for installations over wood or metal studs. Both methods require a low-perm waterproof membrane meeting ANSI A118.10 applied in a manner specified by the membrane manufacturer to provide a water-vapor permeance rating of 0.5 perms or less. If a perm rating of 0.5 or less is not achievable, the TCNA Handbook also recommends the use of a vapor retarder with a perm rating of 0.1 or less behind the wall assembly. Keep in mind that integrated bonding flange drains should not be used if the vapor retarder behind the wall assembly is required. Waterproofing should not be confused with vapor retarding. Organic mastics should never be used in either steam room or steam showers and the use of natural stone in steam environments should be extremely cautioned. Dan and Elizabeth Lambert of Lambert Tile and Stone located in the Vail Valley of Colorado have been providing high-end residential tile installations since 2000. Dan is a Regional Board Director for the NTCA and sits on the NTCA Methods and Standards Committee and the Technical Committee. Lambert Tile and Stone is a NTCA Five Star Contractor and employs Certified Tile Installers (CTI). Certifying our employees is so important to us that we hosted our own testing site at our warehouse with support from our local community who provided us with the lumber to build our own testing modules. The local tile stores and distributors sponsored all our meals for two days. Having the CTI designation has been a great tool to show our builder community how we support, test and educate our employees. 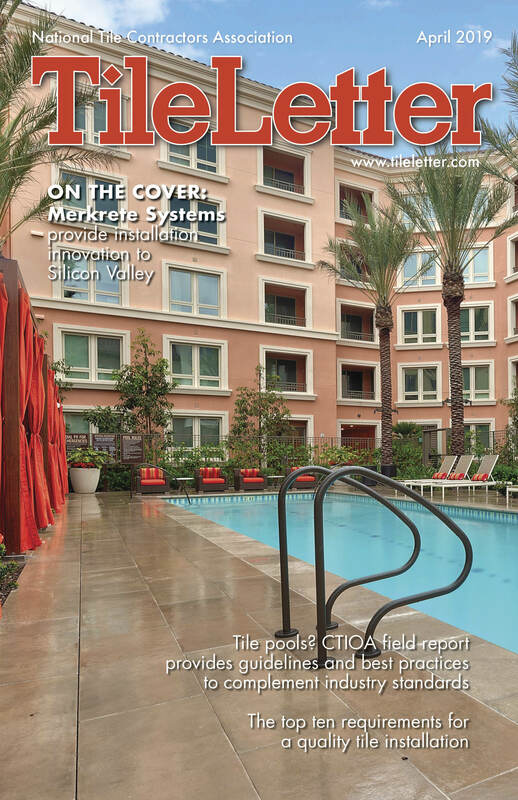 Although we reported on the NTCA Reference Manual in our July TileLetter issue, the subject bears repeating. Because this month, NTCA members will be receiving the 2016-2017 publication in the mail, and it will be available for others in the industry to purchase as well. If you missed the July article, the NTCA Reference Manual is a compendium of knowledge, research and development, brought to you by the NTCA Technical Committee and its members. These members include leading experts from various industry sectors: tile and stone contractors, distributors, manufacturers and others allied to the tile industry. 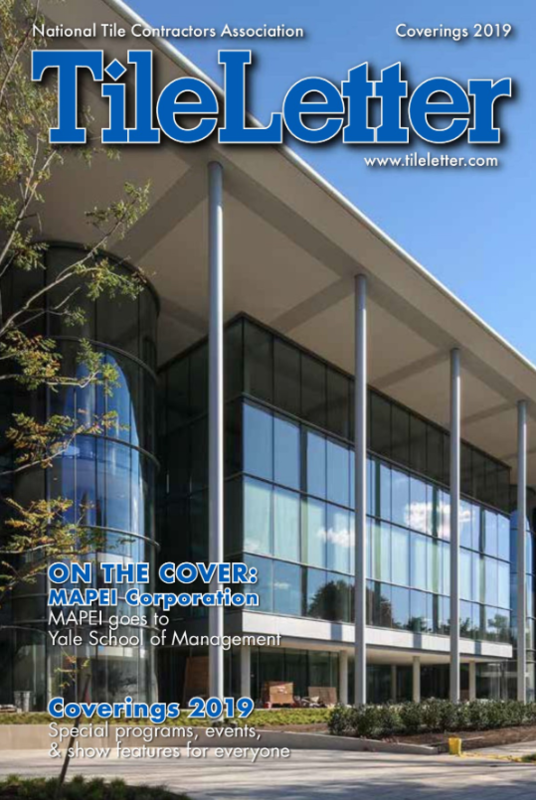 This year’s edition has a different format that follows the flow of a job, and that makes it easier to find content pertinent to your job or challenge. Chapters will begin with General Requirements, Substrates, and flow all way through to Maintenance and Precautions. The NTCA Reference Manual identifies recurring challenges to tile and stone installations and recognizes potential problems. Industry experts come together to achieve consensus on solutions, presented in a problem-prevention-cure format. Clarifying photographs are included, as well as letter templates that address common issues in documentation and negotiation on the jobsite, and can be customized to fit the needs of the contractor. A collection of general position statements about industry issues is also included. Each year, NTCA Technical Committee subcommittee members review and revise the publication, since new technologies, methods and products all impact the experience, practice and outcome of tile and stone installations. Because the information is so crucial to the industry, NTCA also makes the NTCA Reference Manual available on its website HERE to non-members or those who desire additional copies. 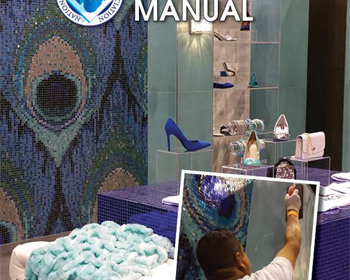 Familiarize yourself with this well-respected companion document to the TCNA Handbook for Ceramic, Glass and Stone Tile Installation and ANSI standards. Together these publications form a triumvirate of expertise and knowledge that creates a strong framework from which to conduct your business. Thank you to everyone who has been providing feedback on NTCA University. Based on that feedback, we decided to make some changes to the pricing structure of the University. We are offering introductory pricing that will include everything in the University, including the Apprenticeship Program. As we continue to develop content and build NTCA University into a premier site, we wanted to offer this pricing so that you can begin to explore and learn. Please make sure that your NTCA company profile information is correct, up to date, and includes names and e-mail address of all of your employees that you would like to include on your NTCA University subscription. We will then use this list from your profile to provide your employees access to the University courses. With your subscription, you are able to watch and learn from any courses within the University, as many times as you want during your subscription. And as more courses are added in the University, you will have access to them, too. As long as you are able to log into your NTCA account, you will be able to access NTCA University from any computer, tablet, or phone so you don’t need to be in the office to learn. If you want to take a course at home on your couch or while on vacation sitting at the beach, as long as you have Internet access, you can learn. Visit the NTCA store at https://tile-assn.site-ym.com/store/default.aspx? to purchase your NTCA University subscription. Please note that if you are purchasing the subscription for your company, the primary NTCA contact for the company must be the account from which the purchase is made. We will then work with the primary contact to establish all the correct contact information for employees who will be enrolled in the University. *If you purchase the all access subscription on the member pricing, in order to maintain your access to the site until December 31, 2017, you must also keep your membership active through 2017. If there is a course that you would like to see available or if you are unsure of the types of courses available, please send me an e-mail at [email protected] or call me at 770-366-2566. Edwardo Martinez and Surfaces 15, the residential remodeling/renovation and commercial company he co-founded two years ago with Greg Twarog in the Chicago area, are committed to standing out in the tile industry. Martinez discovered Ceramic Tile Education Foundation (CTEF) certification through the online Tile Geeks Facebook group and jumped right into the deep end. Martinez, a second-generation installer who’s been a tile setter practically from birth, took the Certified Tile Installer test at Coverings 2016, front and center on the Coverings stage. “I did it backwards,” Martinez said, “No studying, no prep work. I filled a spot last minute. I did it to test my skill and knowledge.” There is a book to study for the certification and while most people take some time to look it over, Martinez jumped at the last minute opportunity. “I was not planning on taking it, but a post on Tile Geeks by (NTCA State Director, Tennessee) Bradford Denny changed the course of history,” he said. The tile industry lacks a universal, national licensing regulation. Some states don’t have any licensing requirements at all for tile installers. The CTEF certification provides a universal standard, recognized by the tile industry, by which tile companies can prove their merits and consumers can find reliable, skilled installers. In addition to these benefits, Martinez points out, “[certification] has made making new networking relationships a lot easier.” Becoming certified has also provided Martinez with more confidence in his skill set and his status “as a true professional and industry leader.” With certification in hand, Martinez has the justification for charging more for his services, because it sets him apart from the norm. According to Martinez, “By being certified, we are able to impact the labor trade in a way it has not been done before.” Having grown up in the trade, Martinez has been in the industry for more than twenty years, but still finds great value in being a Certified Tile Installer. Certification is “well worth the investment and makes you a part of a whole new network,” Martinez said.